Nothing fancy, this is just the basics of basing. Simple bases for your miniatures that look good. Check them out now. In just a couple of weeks, I’ll be heading up to Nottingham for the Horus Heresy and Necromunda Weekender and I’m very excited about it all. 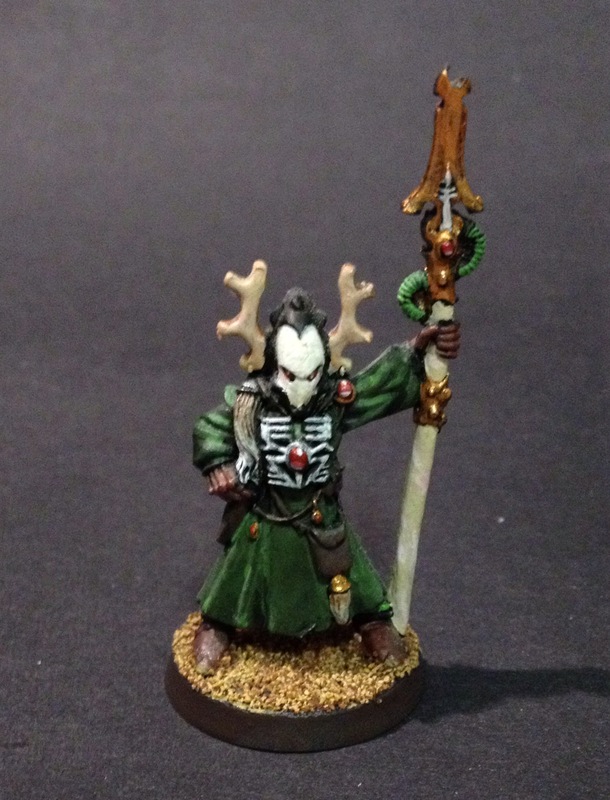 Among the many things to do and see, there is a Golden Demon competition going on, and I wasn’t going to take anything because a) it’s a bit of a hassle, and b) I know the quality of those attending and I don’t want to feel too bad about my own paint jobs. But as I’ve said before on here, you should enter these things for you, and not for other people, and I like to show off my work. It may not be the best but it can stand alongside (albeit slightly behind) the best. With that in mind, I decided to man-up and take a couple of things along. 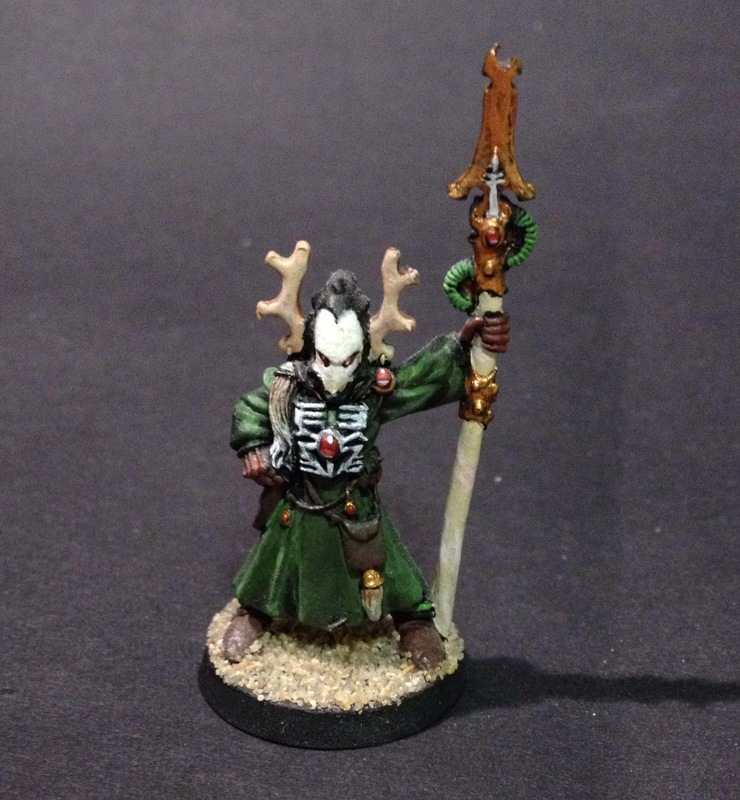 I’m hoping a certain leopard-print-cloak-wearing Praetor will catch some eyes in the single miniature competition, but I want to take a squad too. While I have more than a few display stands for single miniatures, I wanted a plinth that could hold 10 miniatures on 32mm bases. Could I find one of these? I could not. I scoured the net, asked around, and got nothing. So, I made my own. What’s more, I’m actually pretty happy with it (considering I’ve not done much woodwork for the past 15 years) and I thought I’d take you through the process of how I built my squad display stand, especially as you may have to make your own one day too. Here goes. First off, I was up and early one Saturday morning to head down to what passes for a lumber store in my neck of the woods (we’re very good for antique silver birch logs for a fireplace, not so hot on untreated pine planks down my way) to pick up some wood. I bought low quality but straight edged pieces that were a couple of feet long, along with some Gorilla glue, a couple of clamps, and some felt. With everything sawed and sanded (including another little piece to act as a stabiliser for my stand’s stairway design), I did need to make a couple of fixes. Annoyingly a couple of clamps that I’ve had for ages went walkabout, so I had to improvise and I did it badly – we had gaps by the time the glue had dried (O, forgive me, Mr Pitcher [my former woodwork teacher at school] for I have failed you!). But being someone who has a lot of greenstuff around anyway, these weren’t hard to fill (I know this is not the traditional method, but it does fit the theme). A little more sanding, and all was sorted, at least to a level I could live with. I stripped it. As much as I could. It had cured quite well over the upright sections, but even that was loose and tacky. 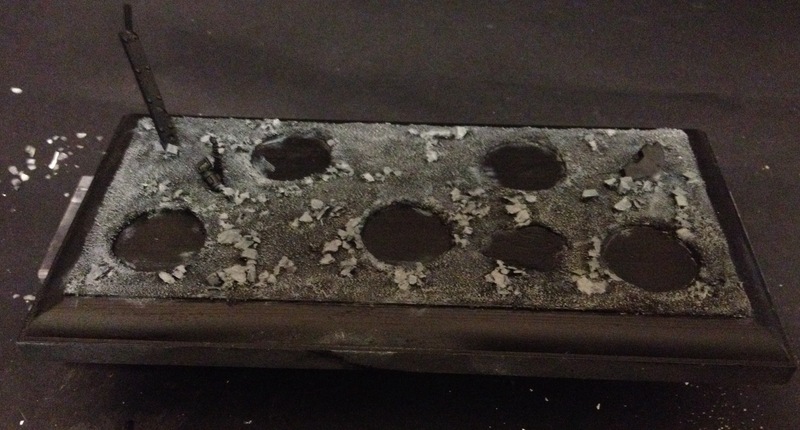 I literally lifted it all off with just a dry tissue too – don’t use this paint if you can avoid it. So what did I do? I used the paint I should have used all along. The unsung hero of so many painting projects. I speak of course of Chaos Black spray. And once that had been applied all over in one even and easy spray (which of course was dry in 5 minutes), it was time to think about magnets. And you know what, I am genuinely proud of this. It may not be the finest bit of carpentry ever, but it’s mine, and it does just about pass muster. It’s a simple design, well executed, and I made it – like I said, genuinely proud. I could have done some things differently, but in the end, I am thrilled with the result, and it was truly rewarding to see each miniature gently snap to it. I’ll be taking my Veteran Blood Angels Tactical Squad up to Nottingham on the 3rd, so if you’re popping along to the event too, keep an eye out for both the miniatures, and my marvellous carpentry (and me!). I very much doubt they’re good enough to do much up there, but after all of this, I just want to see my stand in all of its glory. To help you make your own, the length is 210mm, and each surface is 44mm wide. 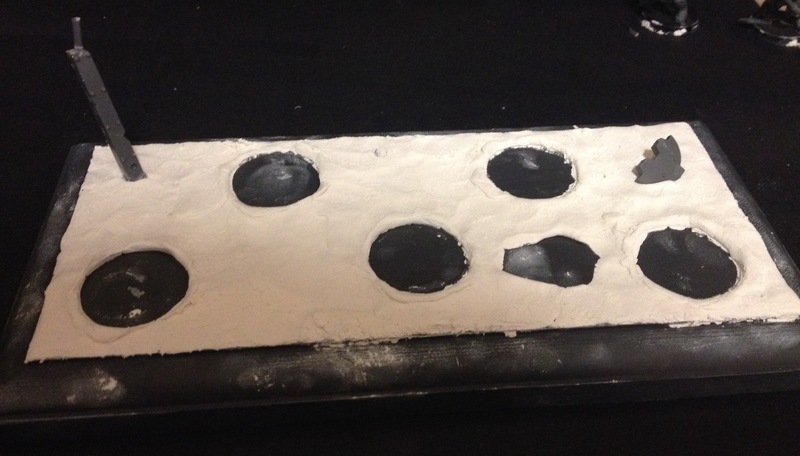 Magnets were placed along a centred line at the following points: 25mm, 65mm, 105mm, 145mm, 185mm. The height of the lower level is 22mm, and the upper level is 18mm. I hope that helps if you do make one yourself! Onwards! Have you ever made a plinth? Have you ever bought a plinth for a squad? Tell me your plinth stories in the comments below. Plinths! I’ve just started working on my Blood Angels Praetor using the big fella from the Betrayal at Calth box set and I just wanted to give you a quick update on my efforts so far. I’m only in the very early stages, but thought you’d be interested in seeing the direction I’m going in with this guy. To start with, I’ve painted a few bits of the model before even putting it together. The model is now in one piece but there were a few bits I painted separately just because it would be easier to do so. The inside of the gorget, the head, the inside of the hood and the inner lining of the cloak were all done in this stage. The head sits so snug into the armour that a) you can barely see the insides of that hood piece at all, so I just gave that a quick once over, and b) the head would have been a pain to do if it was already put together. I’ve decided to go with my brassy gold on much of the armour’s trim, and the lining of the cloak is a very subtle black-to-deep-purple colour. I was concerned that this might look a little too much like Emperor’s Children colours, but I think it will be fine. Praetorian purple was a thing 2000 years before GW got hold of it so I’m going with that. Worst comes, I can say it was pre-heresy gift from Eidolon or something like that. 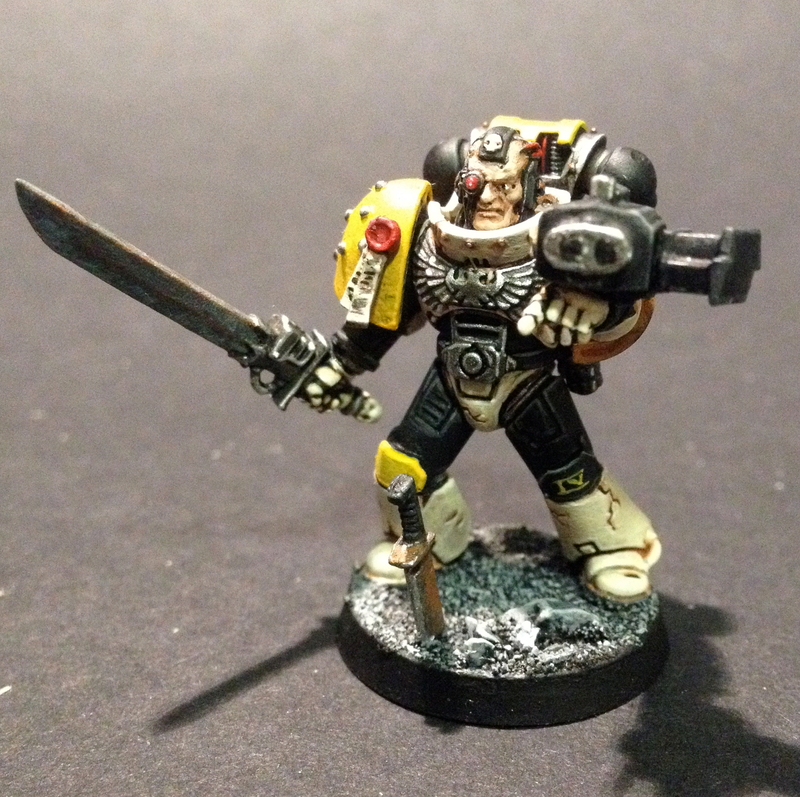 I’m using the above Blood Angels Hero, of 2nd Ed box cover fame, as a source of inspiration for this guy. I won’t be doing like-for-like colours, but the styling will be in part taken from John Blanche’s design. Although I’ve put the guy together, I’ve not started on the armour properly yet, so in future WIPs, hopefully you’ll see more what I mean. And yes, that does mean that there will be a few black flame patterns here and there. So, very early doors there then (pun intended). Just getting some base colours down to get an idea of what it will look like (a little bit of a test too), but still a huge amount of work to do here. This was a just to give you an idea of the direction I’m going with this. 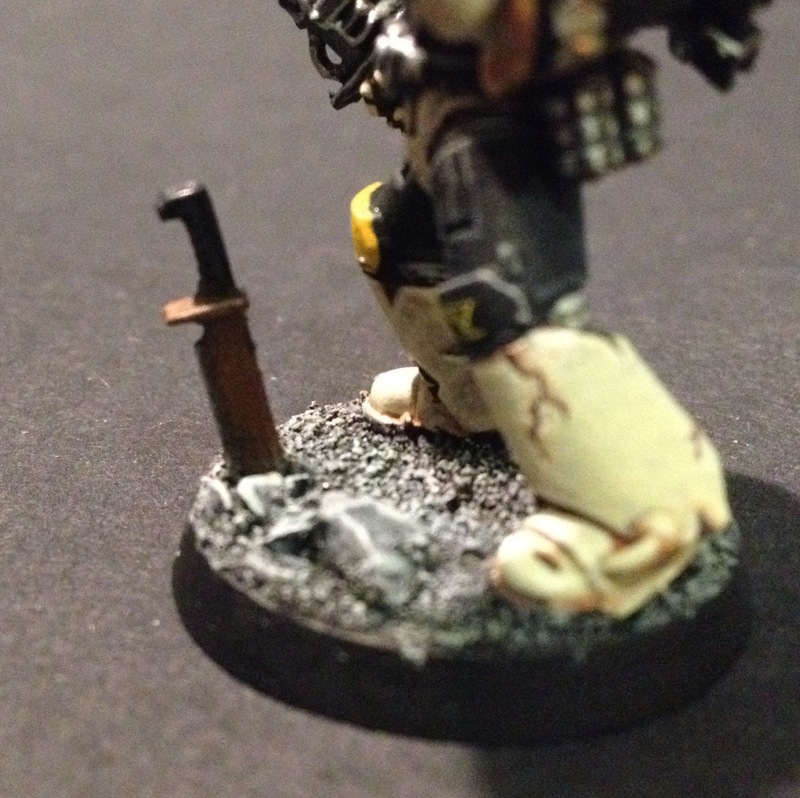 Why an Iron Warriors Land Raider door? Well, a) Hazard stripes do look pretty cool and b) I remember an old, long since retconned bit of fluff that noted the IW and the BA have a particular beef going back to the Heresy. So why not? I couldn’t resist. 😉 Will hopefully bring you another update in the near future with a few more fancy details done. Onwards! 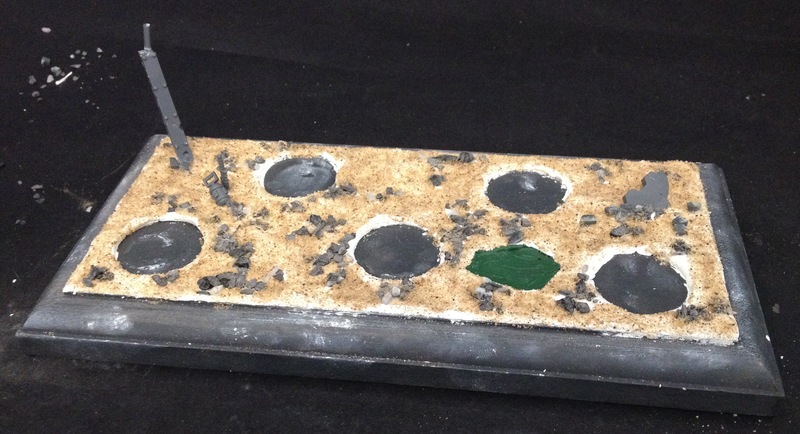 Display Base – Plinthed It. So, I picked up a wooden plinth at Salute, though really any piece of wood will do you. I then primed it with some grey primer to protect it a little from the paints and moisture of the clay. I had a vision in my mind of what I wanted it to look like and I wanted to play to some of my strengths, so I stuck down the girder that you can see at the back there because I know I do a good girder. Then, knowing that I wanted to have five minis with standard infantry bases on there so I used my much abused and shamefully neglected cultists and stuck them on there with some blue tack. 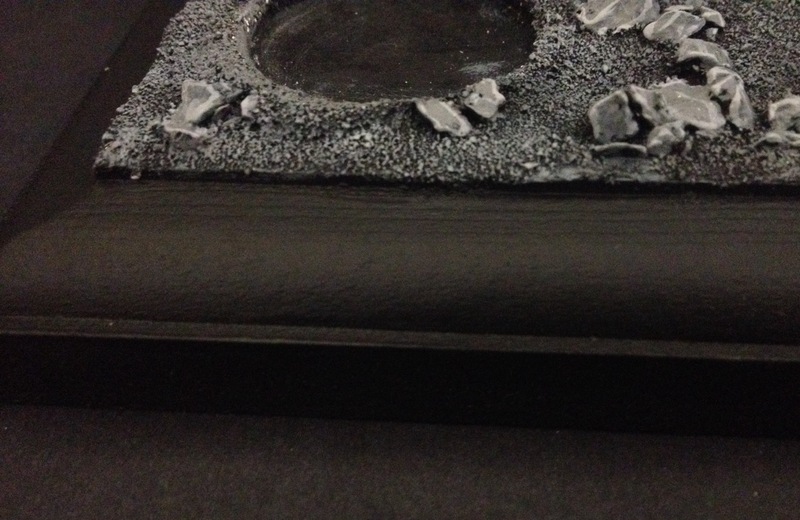 Next up, I used white milliput and covered the top part of the plinth. I didn’t use lots as I didn’t want to go too high. I also left a patch for a puddle. Once it was covered, I stuck in a bit of rhino hatch and left it to dry. And once it was dry, I removed the cultists, making sure that I moved them a little. Milliput shifts a tad and even when you think it’s dry, it still has a little expanding left to do. You can rescue it with a little sandpaper later on, but it’s easier to do it this way and means less hassle further down the line. 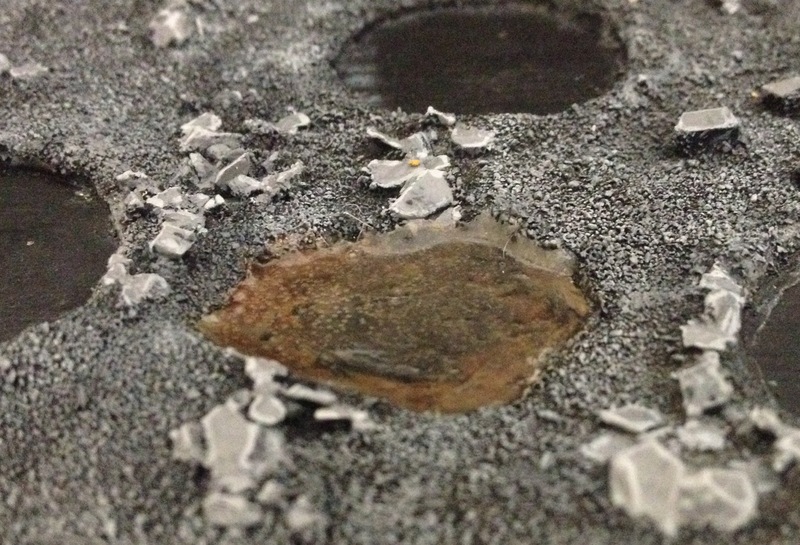 The next part of the process involves adding the texture. This means adding first some rocks (small clumps and clusters of differing sizes around the base in a scatter pattern) and then by adding some sand. I also added a knife and a melta bomb for setting. Finally I layered the bottom of the puddle with some green stuff to removed the wood texture from the bed. When all of that was dry, I gave it a quick blast with some Chaos Black undercoating spray and then left that to dry too. Modelling done, it’s now onto the painting. The first stage for this is dry-brushing with the Citadel paint Dawnstone. Use an old brush and keep it a little rough and natural looking. 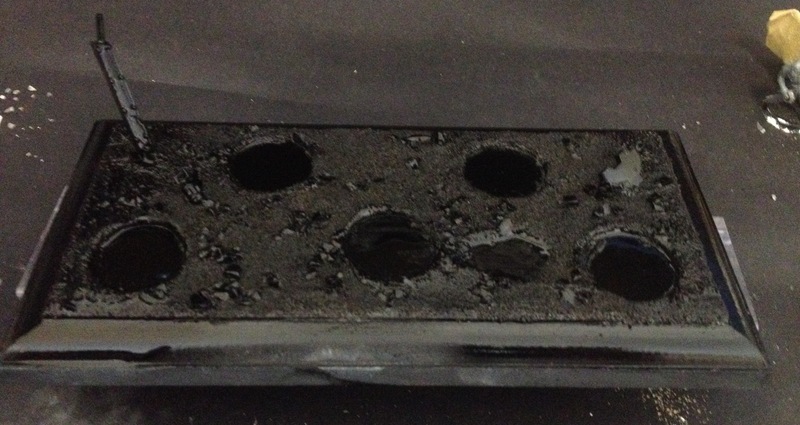 Then, make sure all the rocks are painted a little more solidly with the same paint. 4. It’s the little things. The knife, melta bomb and girder were all painted to go with the theme. 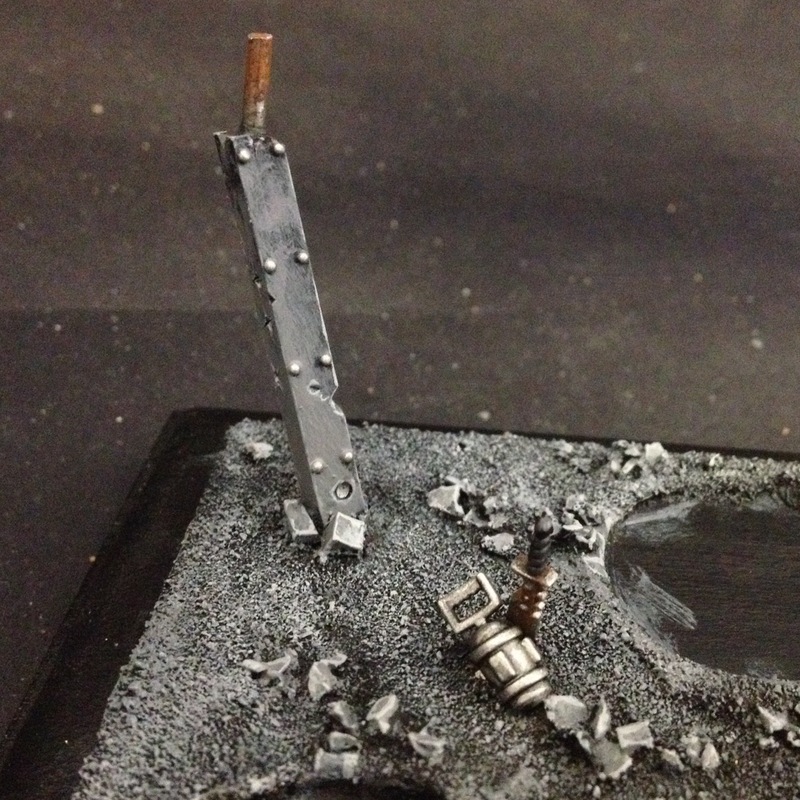 I used the same greys that were used throughout the base for the girder, silver for the rivets and the reinforced pole which then got the rust effect treatment. The knife got really rusty too, but I kept the melta bomb looking pretty clean as if it were newer. And that’s the details done. Last thing is to add the models. I’m really happy about how this turned out and I think the Vanguard Veterans look great sat on there. If I work up the courage to enter a competition, this will provide a nice base for a squad entry and it’ll look spiffing on my shelf too. Any questions, ideas, comments or constructive criticism, please leave them below. I shall leave you with a last shot of my Mortifactors Vets looking awesome. Onwards! 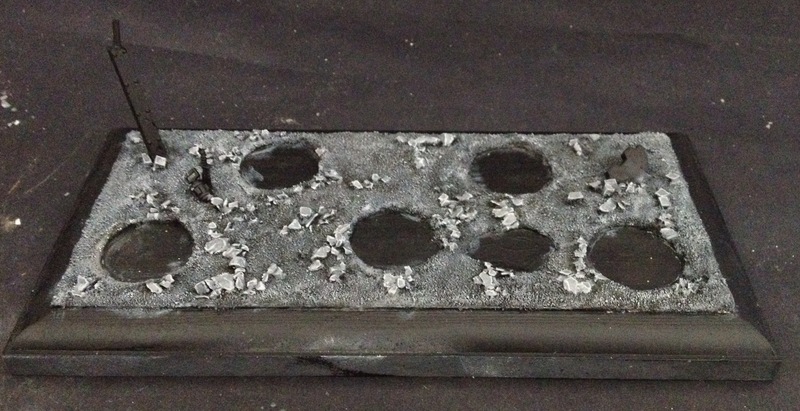 This is the 2nd of my posts relating the the most basic of basing techniques, and today, we’re looking at urban-themed bases. I’m going to take you through exactly how I created the above base and, as well as the base, I’ll also take you through the process to make the rusty knife that features in the image above. This isn’t by any means an advanced basing technique, but I hope it helps to rid the hobby of bare bases and give you some ideas for your own minis. Also, I apologise for the image quality – when I get a good camera, I will reshoot what I can! 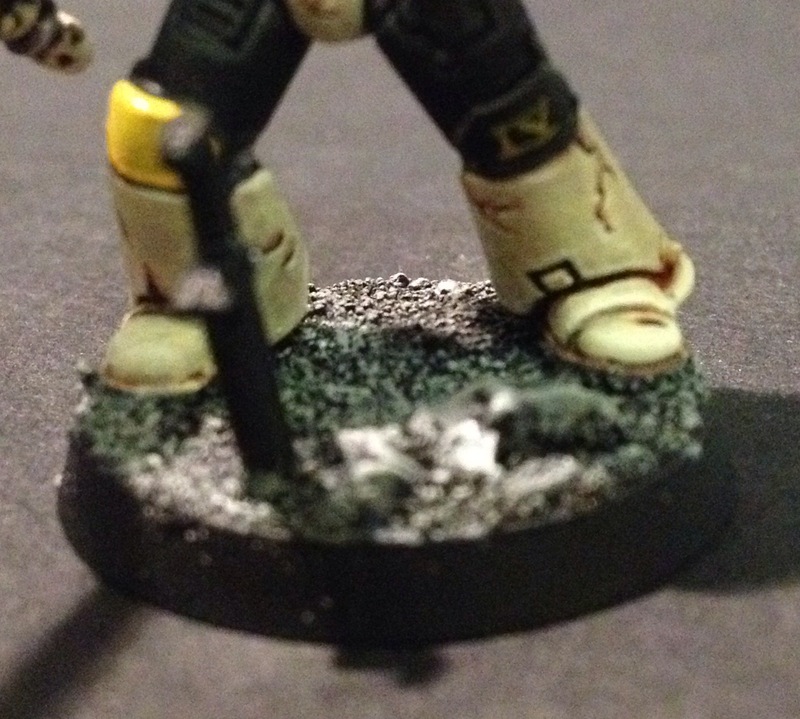 Either add sand to your base before you undercoat (that’s what I do – glue the feet/legs to the base, add sand and rocks, then spray with Chaos Black), or gently, using an old brush, add some chaos black so that it covers all the sand/rocks. 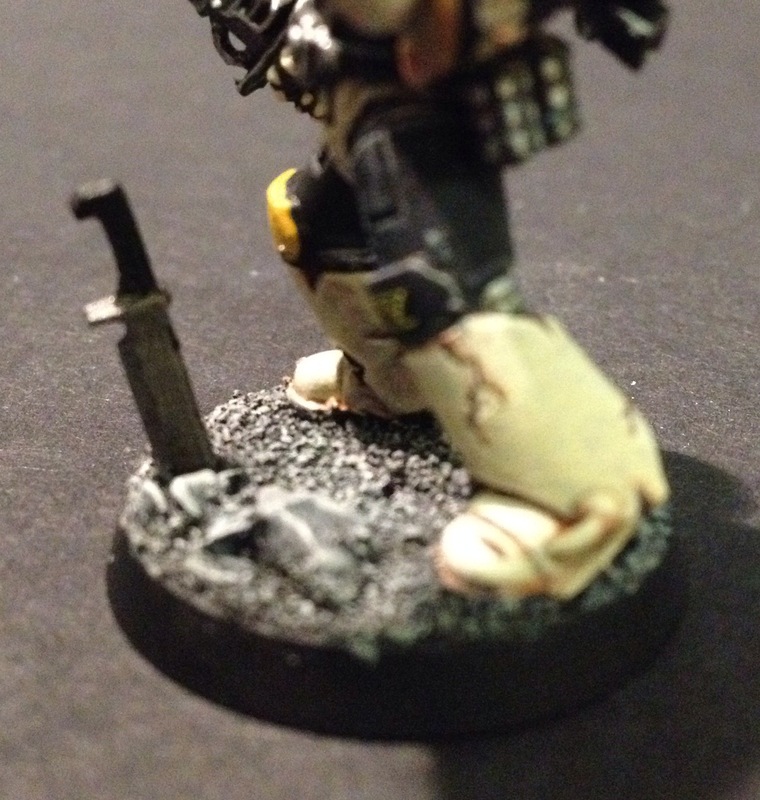 Also, I snipped the tip off a knife and superglued it to the base point(less) down before undercoating. Using an old brush, dry brush the whole base with a medium grey shade. I used Citadel’s Dawnstone. Next, take a lighter grey and dry brush again, but this time, use less, maybe leaving a few areas with almost nothing. 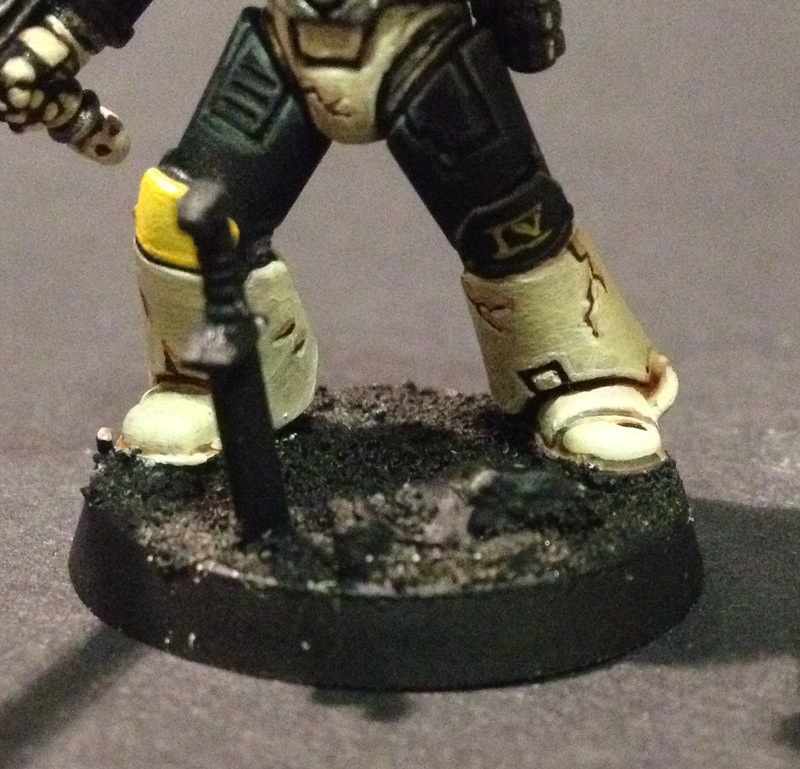 Also, if you have rocks on the base, edge highlight these with the same shade. I used Citadel’s Administratum Grey. Painting the guard and blade, I used Citadel’s Leadbelcher. Knife Stage 2: Rust Part 1. Knife Stage 3: Rust Part 2. This is Ryza Rust, another of Citadel’s new technical paints. When using it, you need almost none of it on your brush. A tiny bit will do because you don’t want your rust to be fluorescent orange – a bit of subtlety is required. Go over most of the knife with this, with it slightly more orange closer to the base, and on top of the guard (google ‘rust’ and look at how it forms). 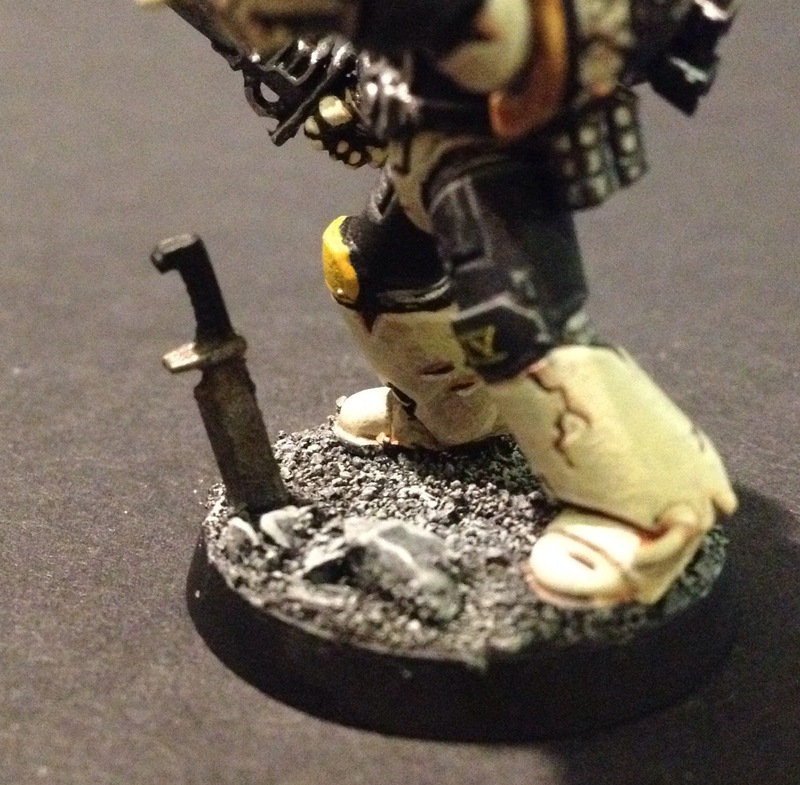 A slight highlight on the blade edge, and around the edge of the guard using Runefang Steel brings a lot of depth to the knife. 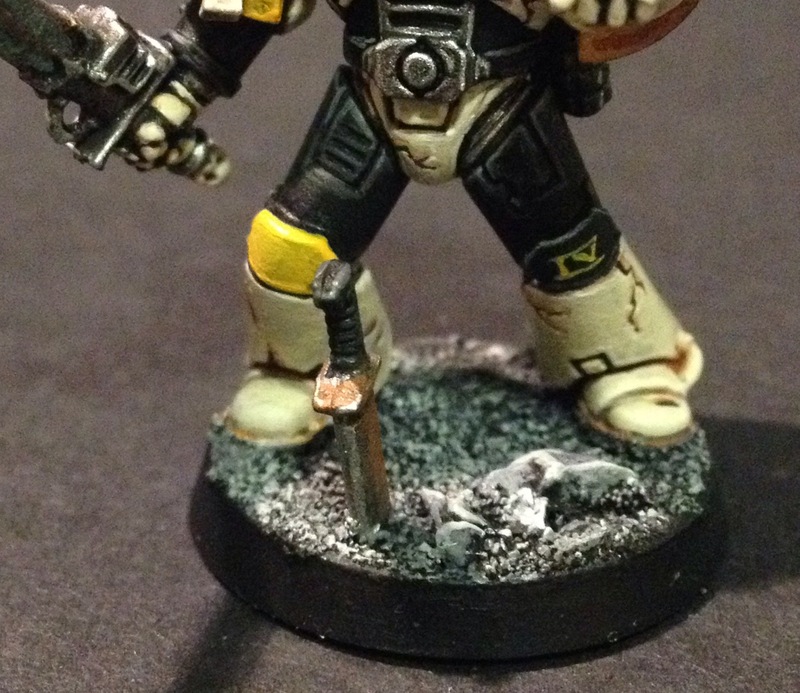 With a tiny bit of grey highlighting on the handle (I used Mechanicum Standard Grey) and you’re done! Both the sand and the rocks came from Games Workshop’s Citadel Basing range which can be found right here. Actually, I’d like to really recommend the Citadel Warhammer 40,000 Basing Kit – lots of rocks, some brass and some nice bits of resin too. As I mentioned, when I can afford to invest in a better camera, I’ll retake what shots I can but this is basically it. Quick, easy and effective. I hope you enjoyed the tutorial – pop a comment below if you’ve got any questions or comments! 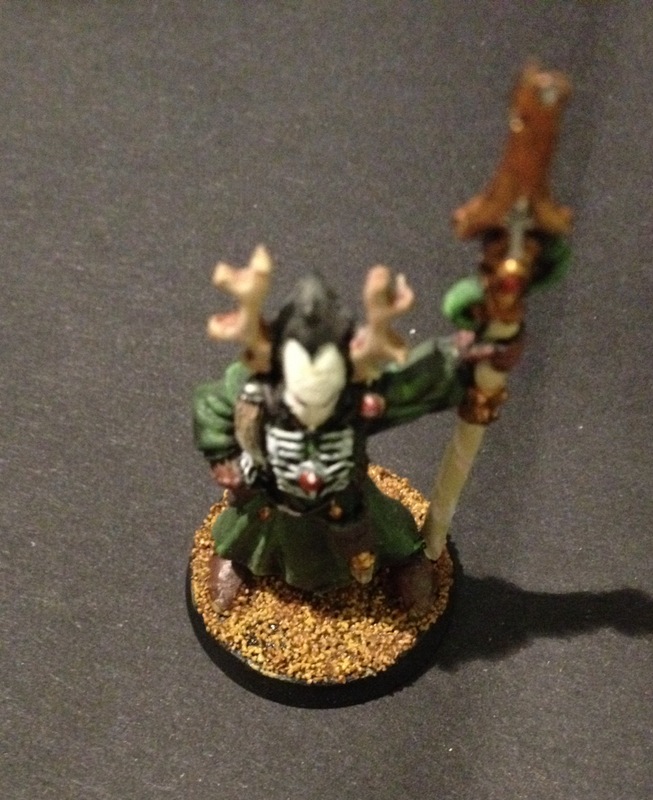 Basing miniatures is not everyone’s cup of tea. Some people don’t bother at all, while others simply paint the plastic green or brown. 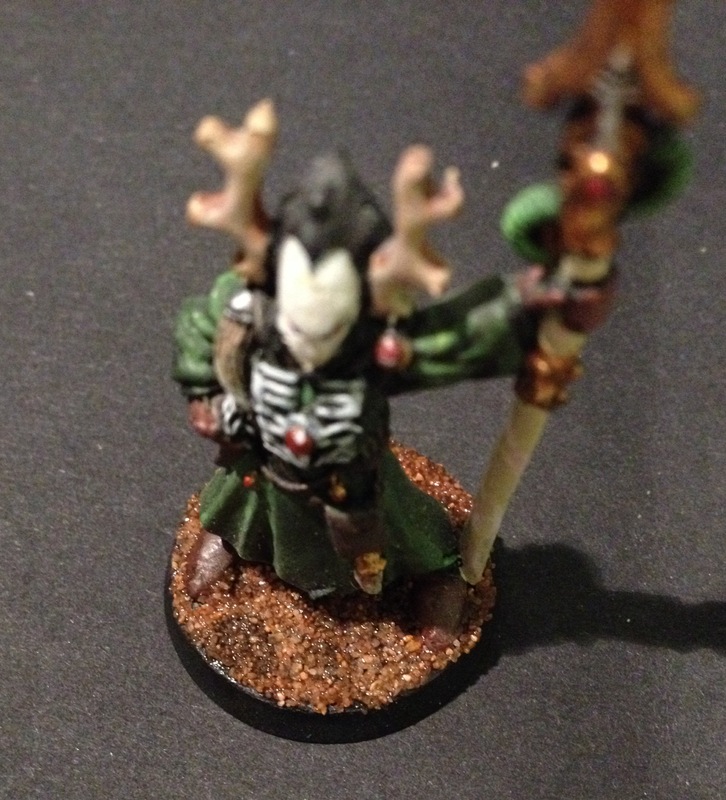 Well, I’m hear to help with a series of posts that will be called Basing Basics. There are loads of wonderful and amazing examples of bases all over the net that utilise advanced techniques and take days to construct. These articles are just going to show you the very (very) basics and maybe we’ll do some more advanced bits and pieces later. 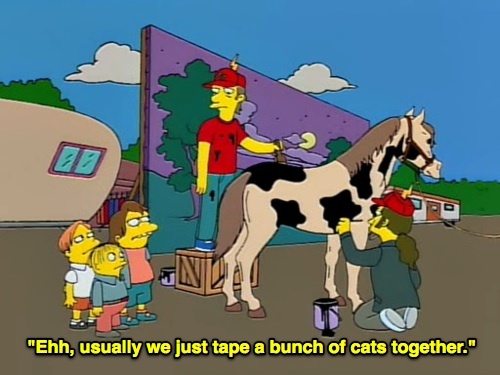 To start with, we’re going to look at sand. You can pick this up at any modelling shop and just cover your bases in it. And there’s nothing wrong with leaving it at that, except that it doesn’t end up looking like sand. I always thought it looked like porridge, so unless your army is battling on Oatius Prime in the Segmentum Cerealus, you need to do a bit of work. 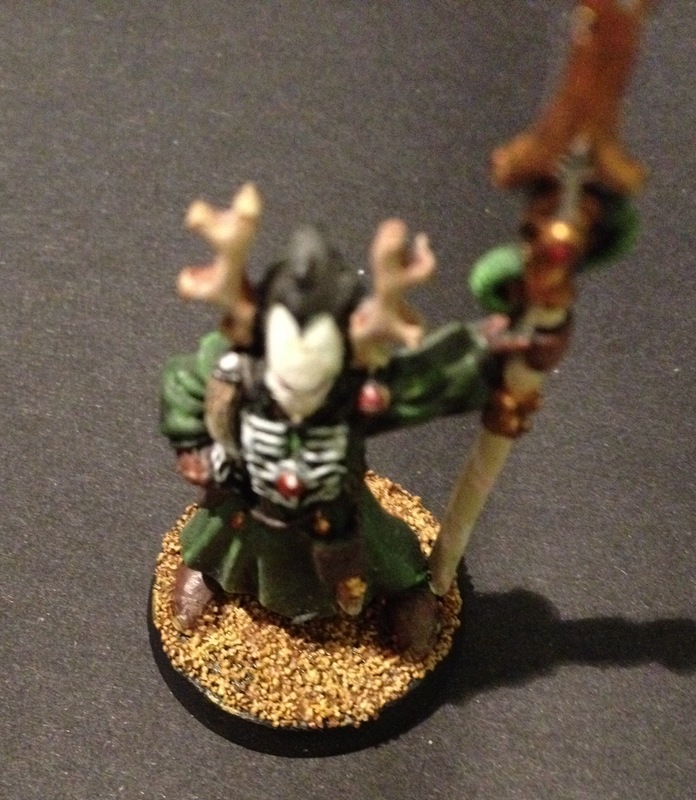 It’s really quick and easy to make sand look like sand and I’m going to use my old Eldar Warlock to help illustrate this. Let’s dive in. Simple as. 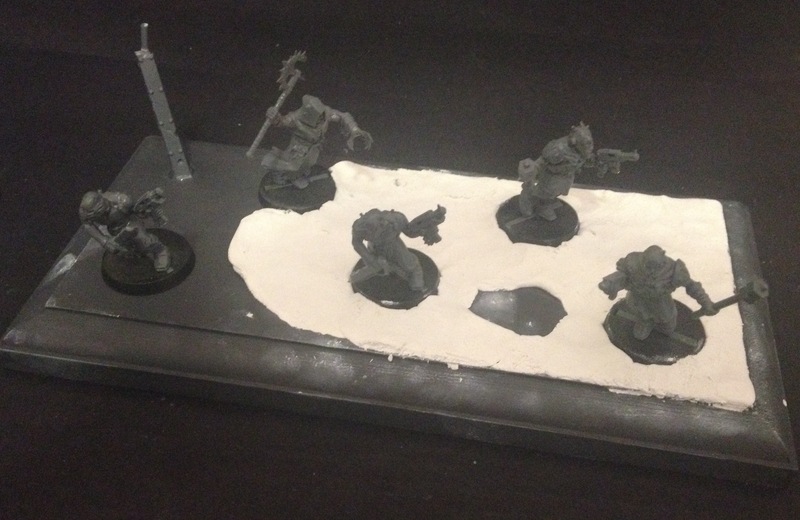 Cover your base in an even coating of PVA glue (not too much) and dip your mini into the sand. Leave it to dry and watch the porridge take shape. 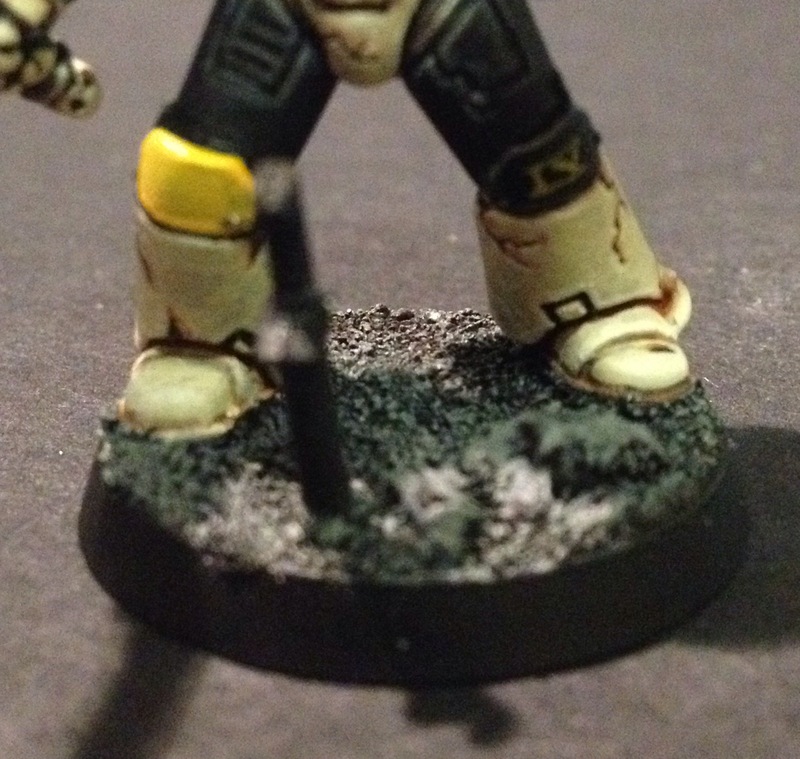 Once the sand is dry, using a larger brush, cover the base in a flesh wash. I used Citadel’s Reikland Flashshade. Once all the porridge is covered, leave it to dry thoroughly. Take an old brush (because the rough sand will knacker the point of a good one) and a sandy coloured paint (this is Citadel’s Zamesi Desert) and dry brush the whole thing. Make sure you let a little of the darker colour come through. When that layer has dried, mix equal parts Zamesi Desert and Bleached Bone (or equivalents) and dry brush again to highlight. Don’t go over all of it, just a few bits here and there. You only need a tiny bit to bring out a lot more depth. To finish off, a bit of Dryad Bark (dark brown) around the sides of the base, and you’re done! This last step just makes the whole thing look a little better on a desert table and gets rid of the last bit of bare, black plastic. Well, how simple was that!? 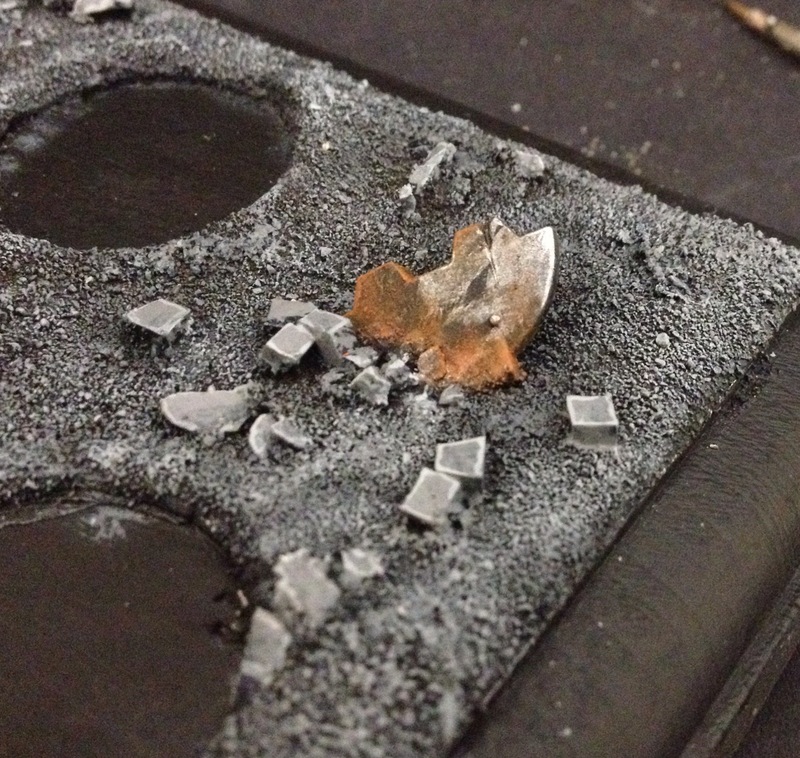 This is a really quick technique (that barely deserves the name) and though you’re not going to win the Crystal Brush with it, it may help your army look a little better on the table top and really add a finishing touch to your minis. Anyway, I hope some of you will find this a bit useful at least – let me know by popping a comment below. Onwards!